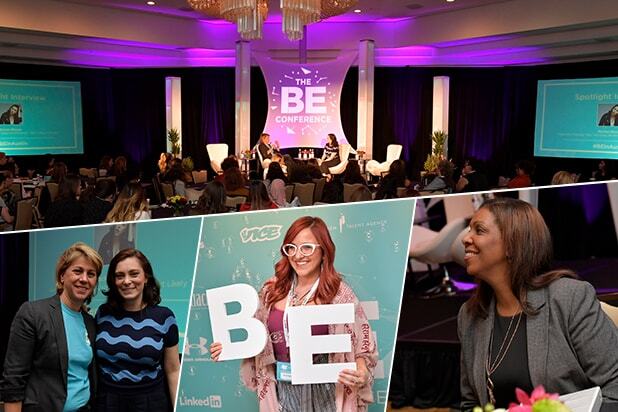 “Baroness von Sketch Show” star Meredith MacNeill attended TheWrap’s BE Conference in Austin, Texas, on Monday and gave advice to millennials feeling pressure to succeed before they turn 30. The Canadian television sketch comedy series also stars Carolyn Taylor and was just renewed for a second season. Sharon Waxman and "Crazy Ex-Girlfriend" creator and star Rachel Bloom at the BE Conference 2018 in Austin, Texas. United State of Women director Taylor Barnes, Texas gubernatorial candidate Lupe Valdez, Women's March LA co-founder Emiliana Guereca, Pussyhat Project founder Jayna Zweiman and TheWrap CEO Sharon Waxman at the BE Conference. Texas gubernatorial candidate Lupe Valdez and NYC Public Advocate Letitia James powwow at the BE Conference. Attendee poses for a shot after checking into the BE Conference 2018. Sharon Waxman introduces the BE Conference. Sharon Waxman with "Fast Color" director Julia Hart and producer Jordan Horowitz at the kickoff event for the BE Conference. Sharon Waxman with Julia Hart and Jordan Horowitz. Attendees at the "Fast Color session." Attendees enjoy refreshments and cocktails while networking Sunday. Alice Founder Walk Monday morning. Attendee enjoy refreshments and cocktails while networking Sunday. Women's March LA Foundation founder Emiliana Guereca speaks on the "Join the New Activism" panel. Attendee enjoys refreshments and cocktails while networking on Sunday. Attendees enjoying refreshments and cocktails during the BE Conference. Attendees checking into the BE Conference 2018. Sharon Waxman and Letitia James during the "Women In The Arena: The New Politics"
NYC Public Advocate Letitia James speaks to Sharon Waxman during the panel "Women in the Arena: The New Politics"
Letitia James speaks to Sharon Waxman during a panel on "Women in the Arena: The New Politics"
Sharon Waxman and Texas gubernatorial candidate Lupe Valdez at the BE Conference. Attendees at the BE Conference. "Join the New Activism" panel at the BE Conference. Texas gubernatorial candidate Lupe Valdez speaks on the "Join the New Activism" panel. Pussyhat Project founder Jayna Zweiman on the "Join the New Activism" panel. United State of Women director Taylor Barnes on "Join the New Activism" panel. The "Join the New Activism" panel. Lisen Stromberg speaks about "Fact-Check: The Truth About Women's Careers." "Crazy Ex-Girlfriend" star Rachel Bloom speaks with Sharon Waxman during the BE Conference's spotlight interview. Rachel Bloom speaks with Sharon Waxman during the Spotlight Interview. Rachel Bloom speaks with Sharon Waxman during the BE Conference's spotlight interview. Sharon Waxman at the BE Conference. "Entrepreneurship: Meet the Founders" networking nook with Hutch CEO Beatrice Fischel-Bock, beGlammed founder Maile Pacheco and The Pink Ceiling CEO Cindy Whitehead. The Pink Ceiling CEO Cindy Whiteheaed at the "Entrepreneurship: Meet the Founders" networking nook. Attendees at the "Entrepreneurship: Meet the Founders" networking nook. Lupe Valdez and an attendee pose for a shot. Afternoon sessions at the BE Conference. Sharon Waxman and Sarah Ann Masse discuss "When Harvey Weinstein Happened - How Hollywood is Changing" at the BE Conference. Sarah Ann Masse speaks on the "When Harvey Weinstein Happened - How Hollywood is Changing" panel. Actress Jessica Barth speaking on the "When Harvey Weinstein Happened - How Hollywood is Changing" panel. CAA-GBG chief digital officer Kendra Bracken-Ferguson on the "Marketing Gurus" panel. Desk Yoga CEO Jacqui Burge delivers a "Grounding Meditation" at the BE Conference. Attendees participate in Jacqui Burge's "Grounding Meditation"
Hutch CEO Beatrice Fischel-Bock on the "Empire Building - Thinking Big From Day One" panel. Sheena Singh teaches women how to rock their LinkedIn profile at the BE Conference. Gabriella Schwartz (Managing Editor & Head of News at Flipboard) moderating the panel "Achieving the Impossible -Career Stories You're Not Going to Believe" with Andrea Razzaghi at the BE Conference. Inside the breakout sessions at the BE Conference. Participants at the BE Conference. beGlammed founder Maile Pacheco, LinkedIn senior director Jennifer Shappley and life coach Stacy Nadeau speak on "Who do you want to BE: The Confidence Gap"
Dorothy delivers the closing performance at the BE Conference. Dorothy and Sharon Waxman close down the BE Conference. The Scene at the BE Conference. BenRiach bar at the BE Conference. Ellen Gilbert (Paradigm, Talen Agent) on the panel "When Harvey Weinstein Happened - How Hollywood is Changing" at the BE Conference. Katie Couric, Baroness von Sketch Comedians to Headline Power Women, BE Conference at SXSW 2018!